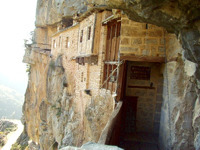 The Monastery of Kipina is close to the village Christoi of Pramanta . According to its history, it owes its name to the gardens close to the monastery that the monks cultivated. According to Serafeim Byzantious the monastery was built in 1212 by someone archbishop named Gregory and is dedicated to the Dormition of Virgin Mary. It is one the most impressive monasteries of Epirus because it is hanged on a high vertical rock. 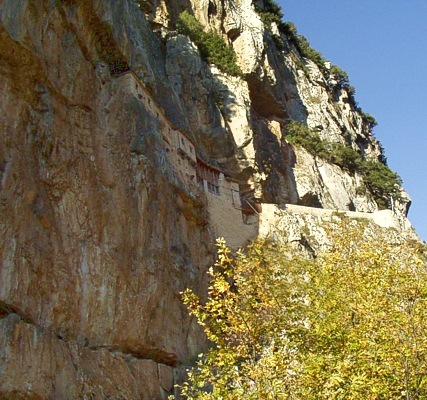 The paved road reaches to the base of the rock and from that point there is a path on the rock and a wooden bridge that lead to the monastery. During the revolution against the Turks the wooden bridge could be moved. The monks moved it with a lever so as to be protected by invasions. The small church of the monastery has a lot of wallpaintings probably of the 17th century. The church has the bulk of the rock as roof which creates a perfect dome. Unfortunately many robers took from the monastery many of its holy heirlooms. At the entrance of the chuch on the left side there is a deep dark cave. During the period of the revolution against the Turks the habitants of the nearby villages were hidden there fro thei safety. The length of the cave is 240 m. and was excavated in 1956 by the speleologist Anna Petrochilou, but it is not approachable.